Syria's Grinding War Takes Toll On Children : Parallels Two million Syrian children have been displaced by the war. Many have witnessed violence and experienced trauma that could have life-long consequences. One of the biggest challenges for international aid agencies is healing the invisible scars of the youngest victims. Children play at the Zaatari refugee camp in Jordan, where more than 120,000 Syrian refugees live. Roughly two-thirds are kids, many of whom have been traumatized by the violence in their homeland. 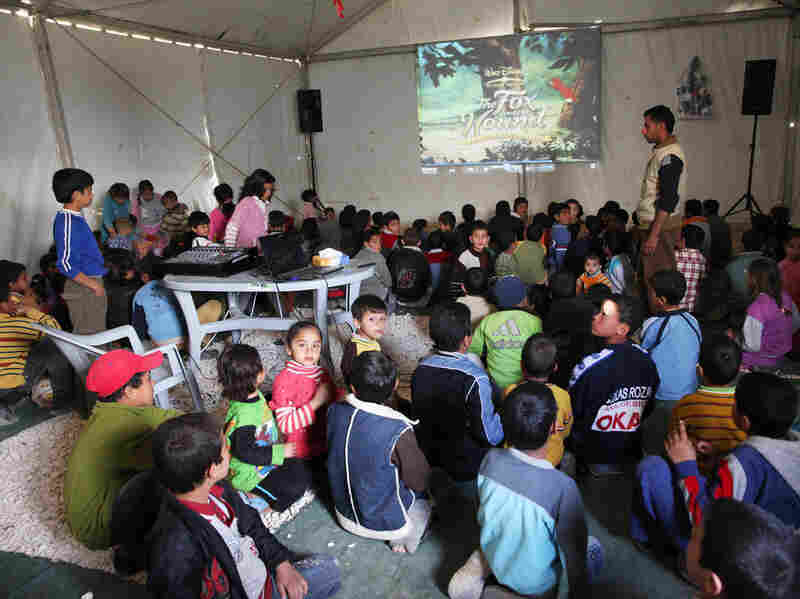 Alexandra Chen, a specialist in childhood trauma, is on her way from the Lebanese capital, Beirut, to the southern town of Nabatiyeh, where she's running a workshop for teachers, child psychologists and sports coaches who are dealing with the Syrian children scarred by war in their homeland. "All of the children have experienced trauma to varying degree," explains Chen, who works for Mercy Corps and is training a dozen new hires for her aid group. Her intense five-day workshop is based on skills and techniques developed in other conflict zones, used for the first time here. "They need to know enough to understand exactly what's going on in the brain of the children they are working with," Chen says of her trainees. Her course stresses the science of severe trauma, which can be toxic for the brain. "The human memory remembers negative memories almost four times more strongly than positive ones," she says. Some 2 million Syrian children have been displaced by the war and more than 1 million of them are now refugees in neighboring countries. One of the biggest challenges for international aid agencies is healing the invisible scars of war in the youngest victims. Mercy Corps organizes games and movies at the Zaatari camp to help children return to more normal activities and routines. "These children have seen terrible things, like bombings and people screaming and people dying, and they've smelled blood and smoke," Chen says as she opens the course. "For them, to be connected to the world feels like a very dangerous thing." Chen tells the trainees that long-term exposure to violence can lead to post-traumatic stress disorder, which is difficult to treat in adults and even harder to manage in kids. Children can remain hyper-alert, with an "inability to step out of survival mode," which is often expressed as anger or aggression. This group has already seen signs of severe trauma in Syrian children who recently arrived. Chen teaches them key skills to build a sense of safety for children. But these newly trained Mercy Corps outreach workers face an overwhelming task. More than 85,000 Syrian refugees have migrated to this part of southern Lebanon, living in the poorest neighborhoods. Aid programs are underfunded and basic needs often go unmet. Still, international aid organizations are raising the alarm over the newest arrivals. They have lived under traumatic conditions for much longer, surviving continuous bombardments, witnessing deaths firsthand, and many need immediate help. Chen moves between workshops in Lebanon and refugee camps in Jordan to tackle the same problem. We met again in Zaatari, the sprawling camp in Jordan's desert with more than 120,000 residents, 65 percent of them under 18. Here, children seem dangerously aggressive, punching, fighting or throwing rocks in the open spaces between the refugee tents and trailers. "Acting aggressively, in many ways, is the mind's way of making sense of what happened before," says Chen, who adds that she has seen behavior change. Many have made progress in a program run by Mercy Corps in a place called Dream Land. 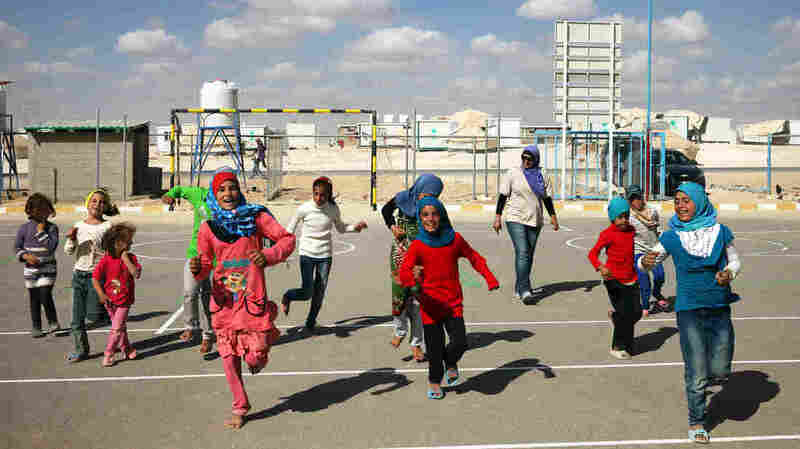 It's in the middle of Zaatari, where kids can feel secure. They play soccer or build sandcastles in soft sand under a large tent that protects them from the sun. Here, kids hammer on Legos in nearby trailers, while others sit, quietly, watching Tom and Jerry cartoons. "The fact that they can sit there for an hour of Tom and Jerry is quite remarkable" says Chen, calling it a sign of healing. But for some, the terrible memories can still become a trigger in daily life. Do You Know What The U.S. Government Is Up To In Syria? "The misunderstanding about trauma is that it is an event we have been unable to deal with in the past," she explains. In severe cases of PTSD, she says, "it is the person's inability to engage with the present that is the problem." There have been some children who sneak into Dream Land in the middle of the night, she says. "There was a little boy who would come at 3 a.m.," she says. "He would hide in the corner of the tent and shake. The stress that he was expressing was too much in his own little mind. He was unable to sleep. So, this is where he came to find refuge." And that was a small success, that he had found a safe place.